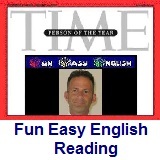 ﻿ Fun Easy English - reading practice and learning about the holiday National Freedom Day. National Freedom Day is a United States holiday held on February 1st. The holiday honors the signing by Abraham Lincoln of a resolution that later became the 13th Amendment to the United States Constitution. Hi. In the classroom today you will learn about National Freedom Day. National Freedom Day is a United States holiday held on February 1st. The holiday honors the signing by Abraham Lincoln of a resolution that later became the 13th Amendment to the United States Constitution. President Lincoln signed the amendment outlawing slavery on February 1st, 1865. Major Wright, a former slave, believed that there should be a day when freedom for all Americans is celebrated. While living in Philadelphia, he invited local and national leaders to meet to organize a movement for a national holiday to commemorate Lincoln's signing of the 13th Amendment. The resulting National Freedom Association proposed a memorial date to call attention to the continuing struggle for freedom for African-Americans. Since President Lincoln had signed the 13th Amendment on the first day of February, that date was chosen to celebrate National Freedom Day. The first commemoration took place on February 1st, 1942, at Independence Hall. On June 30th, 1948, President Harry Truman signed a bill proclaiming February 1st as National Freedom Day. National Freedom Day is not a federal holiday. Government offices and banks are still open for business on this holiday. This holiday celebrates the abolition of slavery in the United States of America. This also is a day to acknowledge the need for freedom for people all over the world. 1. National Freedom Day is held on which day? 2. What does the holiday honor? 3. Which president signed the 13th Amendment to the United States Constitution? 4. In what year was the amendment outlawing slavery signed? 5. Who was Major Wright? 6. The National Freedom Association proposed a memorial date to call attention to the continuing struggle for freedom for which group? 7. The first commemoration took place on February 1st, 1942, at which location? 8. On June 30, 1948, which president signed a bill proclaiming February 1st as National Freedom Day? 9. National Freedom Day is which of the following? 10. Which of the following is true on National Freedom Day?